The film featured here, shot around 1928, contains three distinct sections. The first contains images of the Princeton Polo Team playing on W. B. Devereux Jr. ’04 Field (0:00-5:52). The second section opens with a woman and a small boy after the polo tournament (5:53-5:58), followed by scenes of Prospect Avenue and the various eating clubs located on this street (5:59-6:45). The third section documents the annual inspection of the Reserve Officers’ Training Corps (ROTC) Field Artillery Unit, performed by representatives of the United States War Department. The origins of the film, which does not appear on the list of films that were kept by the Graduate Council in 1931, are unclear. Although polo has been around for millennia, the first documented games on Princeton’s campus occurred in 1902, when Walter Bourchier Devereux Jr. ’04 and a few classmates organized a group of polo matches. The popularity of the sport grew quickly among the students, and by the spring of 1903, Princeton was the first college to officially adopt polo as a collegiate sport. Harvard and Yale soon followed suit. As rapidly as the sport emerged on campus, it soon diminished, due to a number of factors including the cost to secure and maintain horses and lack of interest from later classes. 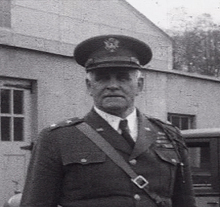 It was not until 1919, with the creation of the ROTC Field Artillery Battalion, that polo would once again be played at Princeton under the leadership of Major J. E. McMahon, 1st Commandant of the Princeton Unit. He introduced the sport to the unit in order for its members to develop fundamental combat skills. 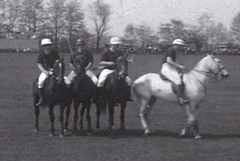 Most of the polo players were members of the ROTC unit and were provided auxiliary horses and equipment by the Unites States War Department; those players, however, who were not members of the unit had to provide their own horses. I n 1921, the Princeton Polo Association was created, headed by Devereux. The Polo Association provided the control and funding needed for polo to become part of the national intercollegiate circuit. With the support of annual dues and alumni, the Polo Association was able to provide new facilities for the players, allowing for all year play. By 1927, an indoor riding hall and outdoor regulation size field was created. 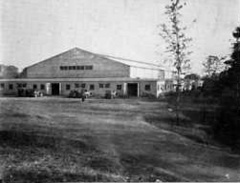 The riding hall (as pictured on the right) was housed in the ROTC armory near Palmer Stadium. The space enclosed 320 by 90 feet, with two balconies, capable of seating 500 spectators. In 1927 the W. B. Devereux Jr. Memorial Polo Field was named in honor of Devereux., who had died n 1923. The regulation size field was located east of Harrison Street and provided a beautiful field for outdoor play. The grandstand (as seen in above still and at 0:25-0:34) provided seating for up to 400. Polo at Princeton flourished as a collegiate sport. By 1942, the Princeton squad had won six national intercollegiate championships. Unfortunately, with the beginning of World War II, most of the players had enlisted and polo at Princeton came to an end, though there were a few unsuccessful attempts to revive the sport in the 1950s and 1960s. However, because of lack of facilities (Devereux Field was replaced with the Harrison Street housing project) and the loss of financial support, ultimately polo disappeared from Princeton. The footage of the woman and the little boy leaving the polo match (5:53), followed by shots of the eating clubs on Prospect Avenue, may indicate that the film was shot by an alumnus returning to Princeton with his wife and son. It is possible the family visited Cannon Club, where two women are seen chatting in between two cars (5:59). The footage from 6:03 shows various eating clubs and views of the street, including shots of the boy walking or sitting on the stone walls. At 6:09 the camera pans from Dial Lodge to University Cottage Club, creating quite a dizzying view. At 6:29 the boy is sitting on top of the Ivy Club’s stone wall with the University Cottage Club in the distance, and at 6:45 he is running on top of the brick wall adjacent to the University Cottage Club. The last section of the film was by far the most difficult part to identify. 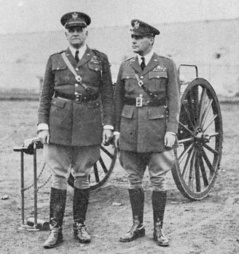 Through a good deal of detective work and a photograph printed in the Daily Princetonian Photograph Weekly (May 17, 1928), we identified Major General Hanson E. Ely and Brigadier General Stuart Heintzelman as the men who performed the inspection of the ROTC Field Artillery Unit on Wednesday, May 9, 1928. One of the most respected and decorated Generals of the United States Army, Major General Ely commanded the Second Corps Area. He can be seen exiting the car at 7:03-7:14, and is captured in a close-up at 15:30-15:35 (left). Accompanying General Ely is Brigadier General Stuart Heintzelman, commanding officer of the Second Coast Artillery District, who is seen at 6:55 exiting the car. 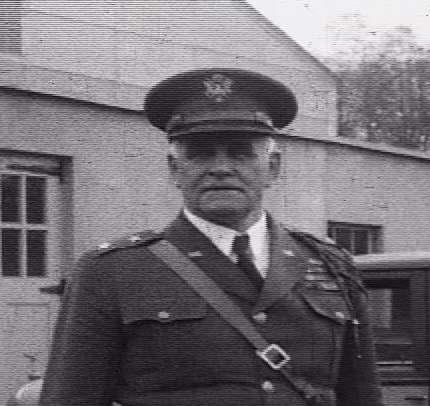 General Heintzelman served as professor in military science and tactics at Princeton in 1916-1917. He also received an honorary Master of Arts degree from the university in 1917. The annual inspection of the ROTC promptly began at 9 a.m. with a rating of all the classes, followed by an inspection of the freshmen gun drill as seen in the film at 13:46-14:41, sophomore equitation (not shown in the film) and juniors in battery mounted drill at 7:35 to 13:20. Hopefully, the juniors were not judged too harshly given the mishap that occurs at 13:21-13:45. 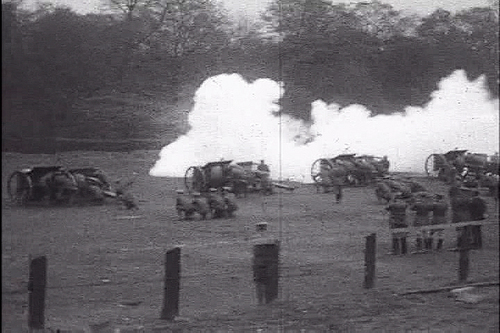 Two of the four mounted horses have toppled over bringing down the front end of the French ’75 cannon. Luckily, aid arrives swiftly from the cadets and the horses and carriage are all back in their upright positions in twenty-four seconds! 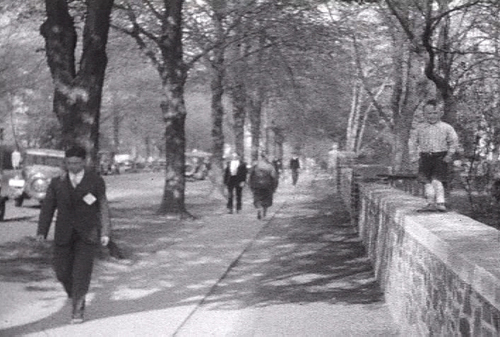 Can you spot the exact moment in the film when this photograph was taken for the Daily Princetonian? I will give you a hint…it occurs sometime between 14:30 and 15:20. Can you spot the man wearing a light suit in contrast to everyone’s dark, military attire? Now look closely at what the man is carrying in his hand: it’s a hand-held camera! The photographer, with camera in hand, escorts General Ely and General Heintzelman and directs them to stand next to the caisson. Notice General Heintzelman turning his head slightly towards General Ely: this is the exact moment, at 14:53, that the photographer captured the image for the Princetonian. This entry was posted in Athletics, Campus life by Mudd Manuscript Library. Bookmark the permalink.